Does Your Cat Have a Drinking Problem? Some cats avoid the water bowl like the plague. Are they crazy, or they trying to tell us something? The toilet. The bathroom sink. The glass on the nightstand. The condensation on the window. These are just a few of the places from which my friends’ cats drink other than their water bowls. And it just gets weirder from there. One Mensa-level kitty has figured out how to turn on the bathroom faucet herself — but she doesn’t bother turning it off. One fetishistic feline licks her human’s feet when he’s done showering. 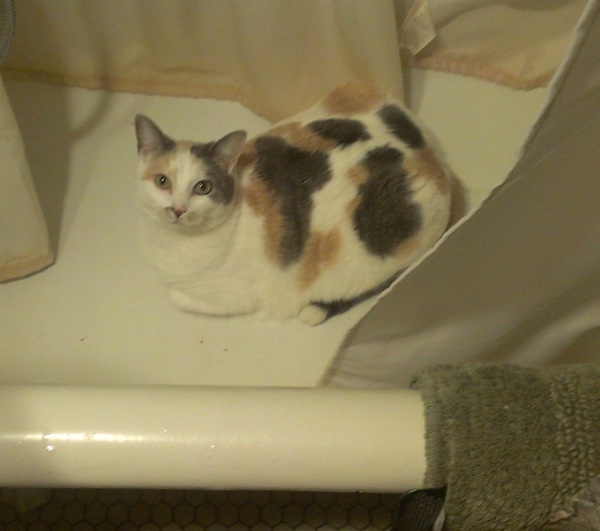 My Bubba Lee Kinsey has a thing for the tub. As soon as I turn off the shower, he jumps in and licks the wet porcelain. So are these cats crazy, or are they trying to tell us something? 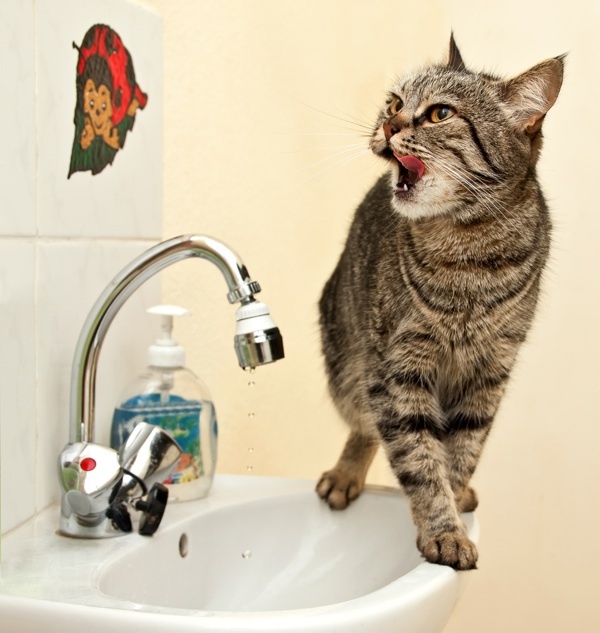 Here are five things to consider if you think your cat has a drinking problem. We might think our cats’ drinking habits are weird. Why do they insist on shoving the glass off the table when they have a perfectly good bowl of water right next to their food? According to Eliza Sundahl, DVM, owner of the KC Cat Clinic in Kansas City, Missouri, the location of the bowl might be a large part of the problem. Because cats evolved in the North African desert where water is scarce, they originally got most of their water from their prey. "The instinctual drive to consume a lot of water is not as great for this animal as it is for others," Sundahl explains. "They come into your life hardwired with a job, and they don’t change what that job is just because they go into your house. The behaviors we see are a reflection of the instincts to do the job well." That job, of course, is murder. But unlike other animals, which tend to be either predator or prey and have developed certain characteristics and behaviors to keep them safe, cats fill the roles of both hunter and hunted. "One of the hallmarks of behavior in cats is that they like to have their resources separate," Sundahl says. "They have to kill the prey, and then they have to go somewhere safe to consume the prey. And in the desert, that may not be where you have your water supply." People have preferences when it comes to drinking. Would you like your soda out of a bottle or a can? Want a plastic cup or a glass for that water? And surely you’ve noticed that when you drink wine out of anything other than a wine glass, it tastes funny. Cats are no different. "There’s a lot of personal preference that comes into it," Sundahl says. "You can notice that the cat likes it out of a glass instead of a plastic bowl. Well, I like it out of glass instead of plastic, too." So if you notice your cat drinking from your glass or licking the bathroom sink, maybe put her water in a glass or porcelain bowl instead of plastic, or try a pet fountain if she insists on water that is delivered directly from the tap to her mouth. Also, try moving the water away from the food -ÔÇô maybe even put it in a different room. Especially make sure the food and water are a good distance from the litter box. Sundahl says this has worked well with her four cats. "Even if I just separate the water bowls by like a foot or two, there’s a huge change in how they go after drinking that water," she says. "They’re much more likely to drink the water when it’s not right next to the food." Also important: Make sure you’re cleaning the bowls regularly. "If I’ve forgotten to clean their bowl out for a day or two, my cats won’t drink the water," Sundahl says. Back in the day, cats got most of their water from their prey, but now so many pet cats primarily eat a dry food diet. 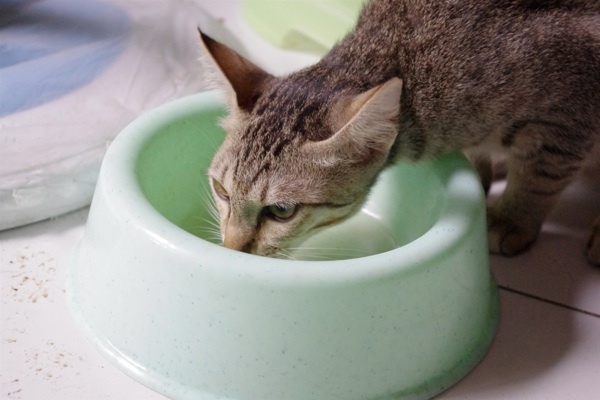 Cats who eat dry food need to drink more, Sundahl says, because they’re not getting the water they need from their food. So one easy way to keep kitty hydrated is to feed him more canned food. "Canned food will always give a cat more water than dry food," she says. "Studies have shown that a cat that eats canned food always takes in more water than a cat that eats only dry food." Many cats have developed strong preferences for dry food, though, so another option is adding water to dry kibble. If the cat will tolerate it, Sundahl recommends giving a cat 50 percent of his calories in wet food and 50 percent in dry. Always consult a vet before making any major changes to a cat’s diet, particularly if the cat has medical issues. Despite their apparent enthusiasm for chasing down a mouse or attacking that feather toy, Sundahl says that cats try to avoid conflict with other cats. Therefore, in multi-cat households, if one cat is a bully, the water bowl can seem dangerous to the cat who is being bullied. This can cause the fearful cat to seek out alternate sources of hydration. "It’s like if somebody is being mean to you by the water fountain at work," Sundahl says. "You’ll go find the other water fountain." Sundahl recommends giving cats choices. For example, fearful cats feel more confident when they are up high, so perhaps introduce a cat tree or two to the environment to help the cat feel empowered. In multi-cat households, try placing multiple bowls in different locations. Also, if the bowl is near a window, make sure there’s nothing outside that could be perceived as a threat. Paying attention to these subtle cues, Sundahl says, can make a great difference in a cat’s overall sense of security and well-being. Kidney disease, diabetes, and hyperthyroidism are the three most common reasons cats will start drinking more water and urinating more. The risk for kidney disease in particular increases once a cat gets older than seven to eight years. According to Sundahl, any noticeable increase in the amount of water a cat is drinking or how frequently he is urinating warrants a trip to the vet for a blood and urine test. 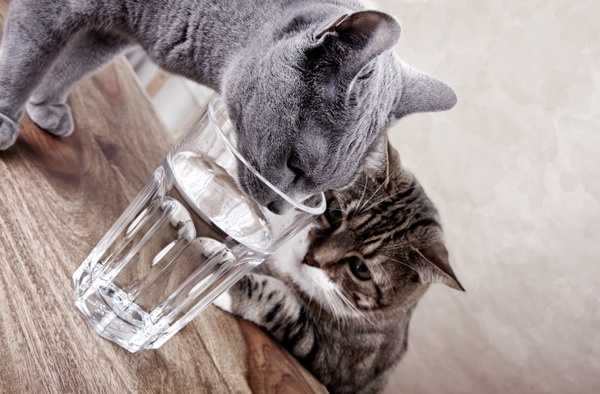 "Any time you look at your cat and say, ‘Man, you’re drinking a lot of water,’ that’s a red flag," she says. "Any time you think there’s an increase in the litter in the pan, and you think, ‘Gee, it looks like there’s another cat living here,’ that’s a red flag." Most importantly, Sundahl recommends paying attention to any changes in your cats’ behavior. "I’m a real cheerleader for having people learn about the true behavior behind what cats are doing," Sundahl says. "It’s often not what we think." Ask a Cat Lady: Do Plastic Bowls Cause Feline Acne?